All my family who live out of the Philippines seem to have a yellow "bible" of Filipino cooking, Filipino Cooking Here and Abroad and my cousin gave me my very own copy for my birthday! Now there was no excuse for not trying some dishes of my heritage. When my Filipino cousin (the husband of the cousin who had sent me the book) saw me preparing the egg wrappers, he commented that he had rarely if ever seen them made from scratch, as I guess they're normally bought - like me buying corn tortillas for Mexican I suppose. It took me a while to get the hang of them, as my instinct was to cook them till slightly brown. These ones need to be still yellow and soft, perfect for rolling. Once I got the hang of it, they came out nicely, although for next time I have to challenge myself to make them a little thinner! Rolling the pancakes wasn't as challenging as I expected. I just had to remember my fajita rolling experiences and not pack them too much so they burst at the seams. With a slice of lettuce and just enough filling my Filipino fresh spring rolls looked just like I remembered them. Dipping them into the sauce was also a familiar experience reminding me of what I love about the flavours and textures all melting together in my mouth! 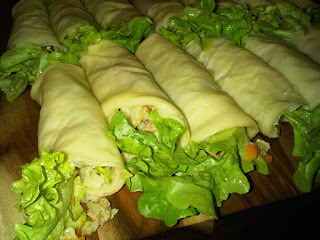 Love lumpiang sariwa with a panckae type wrap! Yum! Great working making it from scratch!